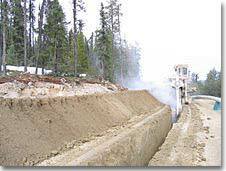 LHE Ditch specializes in rock trenching, primarily pipeline construction. With our chainsaws we have successfully excavated rock from Panther Creek, AB to Buckinghorse River, BC on Canada's eastern slopes; and have been involved in trenching across Canada, North Africa and the USA on projects from 4" to 48" pipe diameter. We are capable of widths up to 54" in rock and 72" in dirt, with depths of 10" to 16' in rock and 10' in dirt. Our experienced personnel and expertly maintained fleet of Trenchers are available for you 24/7.